Aug. 29, 2018 (EcoSophia.net) -- The noise and bustle generated by the ongoing three-ring circus of U.S. politics in the era of Trump can make it hard sometimes to notice that performances just as colorful, and sometimes as absurd, are underway in other countries as well. One example that’s been on my mind of late is Brexit: the impending departure of Great Britain from the European Union, which -- whether or not a deal is signed between London and Brussels -- will occur on March 29 of next year. Various pundits and politicians are insisting at the top of their lungs that should Brexit happen without some kind of negotiated arrangement that more or less nullifies its effects, the results will be catastrophic. This sort of rhetoric isn’t new; all through the campaign leading up to the Brexit vote in 2016, the Remain faction made so much use of doleful predictions of this kind that headlines saying BREXIT WILL GIVE YOU CANCER and the like were all over British humor websites. Even so, the drumbeat of dire predictions has been constant enough that some of my British readers have asked me in worried tones if I can offer some insight into what’s likely to happen. One traditional way to do this is to use mundane astrology -- the branch of astrology that deals with the lives of nations. I’ve been doing that on this blog at intervals for a while now, with tolerably good results. The essential tool of classical mundane astrology is the ingress chart, a chart cast for the political capital of a nation for the moment of one of the solstices or equinoxes. The Aries ingress, which occurs at the spring equinox around March 21 each year, is the most important of the four ingresses, and since the 2019 Aries ingress will occur just a few days before Brexit, it’s the chart we need to assess. Before we go on, it’s probably necessary to deal with one of the standard questions that people ask astrologers: why? Why do the positions of the planets relative to the 30° wedges of the ecliptic that astrologers call the zodiacal signs, and the position of these relative to another set of wedges of space, the mundane houses, which are calculated from the point of view of the observer, predict the future? Why do those 30° wedges have the effects they do, even though the stars that occupied those wedges in Babylonian times have moved on due to the precession of the equinoxes? And why should the chart cast at the moment of the spring equinox of 2019 in London provide insight into how Britain will fare through Brexit? There’s a simple answer to this, which is that nobody knows. Astrology didn’t come into being because somebody decided to cook up an elaborate theory about planetary influence. It came into being because people who watched the skies in various parts of the world in ancient times noticed that certain relationships among those little bright dots in the night sky provided reliable advance warning of certain events down here on Earth. Fast forward through five thousand years of observation, recordkeeping, and increasingly exact mathematics, and you’ve got today’s astrology. Just as Isaac Newton famously refused to speculate about why gravity works, and restricted himself to talking about how it worked, modern astrologers by and large frame no hypotheses as to why their art works; all we know is that it works. With that out of the way, let’s look at the chart. Those of my readers who don’t know their way around an astrological chart will want to know that the inner circle is the notional earth; the outer circle with the numbers and squiggles on it is the notional heavens; the twelve compartments of the space between are the twelve houses, with the planets distributed in them. The horizontal lines marked 10° Scorpio 22’ and 10° Taurus 22’ mark the horizon; the one on the left marks the point of the ecliptic (the sun’s track against the heavens) that’s rising at the moment for which this chart is cast, and the one on the right marks the point that’s setting. The arrow pointing not quite straight up, ending at 25° Leo 16’, marks the point of the ecliptic furthest north of the celestial equator at that same moment. The point that’s rising is called, reasonably enough, the ascendant; the point that’s furthest north is called the midheaven. Keep these in mind. In reading an ingress chart, the first thing you do is figure out how long the chart will be effective. That depends on the sign of the Zodiac on the ascendant. In this chart, it’s Scorpio, which is a fixed sign -- all signs are either cardinal, fixed, or mutable -- and that means the chart will be effective for an entire year. Why? Nobody knows. It just works that way. Once that’s settled, you look for the Moon and the planet that rules the ascendant, which represent the ordinary people of the country, and the Sun and the planet that rules the midheaven, which represent the government. Those, their positions in the chart, and the aspects they make to other planets, give you an effective overview of what’s going to happen during the period when the ingress chart is effective. All told, the ordinary people of Britain are in for a moderately rough ride over the course of the year -- but it’s safe to say they’ll give as good as they get. The eleventh house is the house that rules Parliament; the Moon in the eleventh house, especially with one of the aspects we’ll be discussing shortly, predicts turmoil in Parliament, public disagreement among members of the Cabinet, probable changes in Cabinet personnel, and movements to increase the power of the voters over the political system. The ascendant in this chart is in Scorpio, and that’s ruled by Mars. 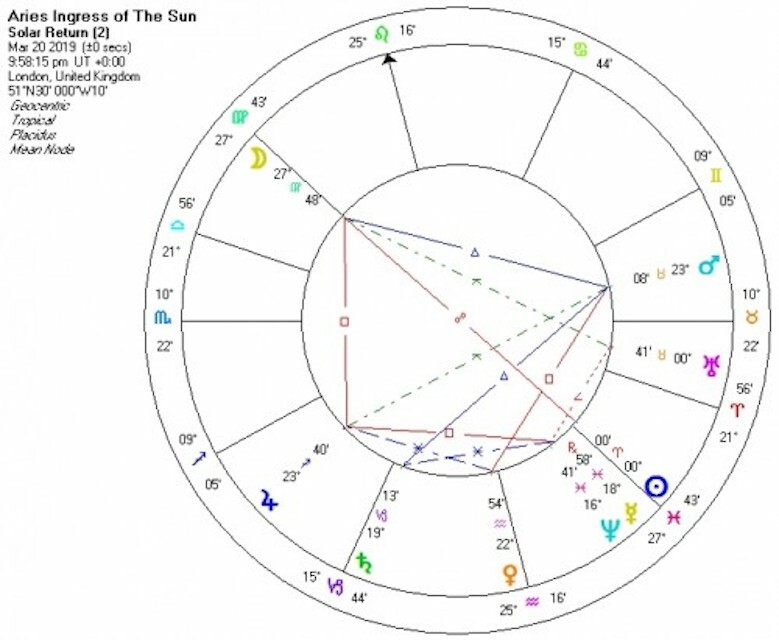 The red planet in many ways dominates this ingress chart; it’s in an angular house, which strengthens it, and it has a flurry of aspects relating it to other planets in the chart. In the seventh house, it predicts disputes and disagreements with other nations. Relations with other countries will be broken off, and the nation will lose friends abroad and be criticized harshly by foreign politicians. If Mars was strong by sign and heavily afflicted by square aspects, there would be a real risk of war. Fortunately, Mars is in his detriment in Taurus, thus weaker than usual, and so it’s safe to say the disputes will stop short of missiles and bombs. The only square aspect, furthermore, is with Venus in the fourth house; this is -- I’m quoting directly from H.S. Green’s textbook on mundane astrology -- “unfortunate for the exchequer, taxation, and financial questions affecting foreign relations.” That is to say, Mars in this chart is the planet of Brexit. We can confirm this by certain traditional indicators. When Mars is in the seventh house, you can get some sense of the country or countries on the other side of the disagreement in two ways. First of all, each of the zodiacal signs represents a compass direction, with Aries standing for due east, Cancer for sue south, Libra for due west, and Capricorn for due north. Taurus stands for a direction somewhat south of due east. What’s south of due east from London? Why, Brussels, of course, and Europe more generally. Mars, as the ruler of the ascendant, is also one of the two significators of the common people; what’s more, it’s in trine aspect, the most favorable aspect, to the other significator of the common people, the Moon. This can be read in two ways, and both of them are most likely valid. The first is that, while large swaths of Britain’s privileged classes are aghast at the prospect of Brexit -- what about our holidays in Spain? What about our Jeremy’s prospects for attending a German university? -- by and large, the English masses are in favor of it. The second is that they are right to do so, as Britain’s departure from the EU will by and large benefit the ordinary working-class Briton. The logic here is simply a matter of supply and demand: by increasing the labor supply and the population, schemes for free trade and the free movement of laborers drive down wages and working conditions and drive up joblessness and rents. What’s more, these effects aren’t accidental; they’re the main reasons -- the actual reasons, that is, not the ones bandied about by the media and the pundits for mass consumption -- why free trade and open borders are pushed so enthusiastically by the well-to-do. In computer-geek jargon, the mass unemployment, stagnant job market, and soaring rents that have driven so many working-class Britons into destitution and misery since Thatcher’s time aren’t bugs, they’re features, meant to increase the wealth of those who benefit from lower labor costs and higher real estate values. In turn, the outcome of the Brexit vote and the resurgence of traditional socialism within the Labour Party are part of the blowback from those policies. Notice, by the way, that the Moon is all by herself in one half of the chart -- the half that extends from the eighth to the first house -- and that all the other planets form an arc that fills the other half of the chart. That arrangement of planets shows that the people are on one side of the issues dominating this chart, and all the institutions of British public life are on the other side. Since the Moon is elevated (i.e., closer to the midheaven) than the other planets, and increasing in light (i.e., in the half of her cycle before her opposition to the Sun), it’s a safe bet that the people are going to win this one. Now let’s look at the other side of the equation. The Sun and the planet ruling the midheaven, as already noted, stand for the government, and since the midheaven is in Leo, which is ruled by the Sun, it’s the same in either case. The Sun is in Aries in the fifth house; since the Sun is always in Aries in an Aries ingress chart, we can disregard that, but the fifth house is important. In a mundane chart, this is the house of the leisured classes. In that house, and in a hard opposition to the Moon, the Sun shows that the government during the period of this ingress will be seen as solely concerned with the interests of the privileged classes and opposed to the interests of the common people. That’s a dangerous place for a government to be in a society where governments have to rely from time to time on the will of the voters. I don’t see any sign that there will be a general election called during the year covered by this chart, but there could well be a change of prime ministers; there will certainly be turmoil in the Cabinet; and if there’s a by-election, the govenrment will not be happy with the results. We’ll have to wait for another chart to see how the election works out, but unless the Tories suffer a sudden, serious attack of basic common sense, the outlook from this chart is not in their favor. Let’s move on to the other planets. The most important of these and, I suspect, the most startling to my readers, is Jupiter in the second house. He’s in Sagittarius, thus very strong -- Sagittarius is both ruled by Jupiter and Jupiter’s night triplicity -- and though he’s afflicted by squares with the Moon and Mercury and an inconjunct aspect with Mars, he’s strengthened by a sextile aspect from Venus conjunct the fourth house cusp. In mundane astrology, a strong Jupiter in the second house has a clear and straightforward meaning; it predicts a significant economic boom. Yes, I know, that’s not what the pundits are predicting, but the pundits’ other predictions haven’t exactly stood the test of time very well, have they? The economic logic we’ve already discussed explains the coming boom readily enough. A modern economy depends on consumer expenditures for prosperity. When most consumers don’t have enough money to meet the ordinary requirements of life, much less the occasional luxury, the economy falters. What’s more, you can’t balance this out by handouts to the already comfortable, because the rich are by and large much less efficient consumers than the working classes and the poor. If you give a rich man a million pounds, he’s probably going to squirrel it away in an investment offshore, where it does no good to anyone. If you give 10,000 working-class families 100 pounds each, on the other hand, you know as well as I do that they’re going to spend it, and since their expenditures are someone else’s income, the whole economy benefits. That’s the howling logical fallacy at the heart of the austerity policies so dear to neoliberal economists and the kleptocratic rich. As Henry Ford pointed out a very long time ago, the prosperity of the whole economy depends on the prosperity of the working classes. Policies that beggar the working classes for the temporary enrichment of the privileged thus always turn out to be a bad idea in the end. So the end of EU policies that permit foreign workers to flood British labor markets, and foreign products to do the same thing in British shops, will bring about a significant improvement in the British economy. This doesn’t mean it’s all smooth sailing. Jupiter square the Moon predicts financial scandals and extravagance, which will put a sharper edge on the backlash from the public. Jupiter square Mercury means that overseas travel and foreign trade will be disrupted. This and Jupiter inconjunct Mars also predict that scandals relating to religion will be much in the news, though it doesn’t say which religion or religions will be affected. A big juicy scandal in the Church of England? A bunch of mosques caught red-handed spreading jihadi propaganda? We’ll just have to wait and see. Jupiter sextile Venus on the fourth house cusp, on the other hand, predicts a good year for agriculture, though it also warns of heavy rains during the year. Let’s move on. Saturn in his own sign of Capricorn in the third house, trine Mars and sextile Mercury, shows that transport and communications (ruled by the third house) won’t be anything like as badly affected by Brexit as the pundits currently insist. There will be extensive delays and bureaucratic snafus, to be sure, but Saturn is a stabilizing influence, and things will sort themselves out in due time. Mercury and Neptune conjunct in Pisces, the sign Neptune rules, in the fourth house makes for interesting times in the media. Mercury is retrograde, which weakens him, and in Pisces, the sign of his fall, which weakens him far more drastically; he and Neptune are both applying to the conjunction (Mercury backing up, Neptune moving forward) so Neptune’s powers of confusion, delusion, frantic excitement and mental vagueness will be exercised to the full in the British media in the year ahead. As Brexit nears, expect a torrent of scare stories from pundits who have convinced themselves that Britain’s departure from the EU means the end of the world, aided and abetted by European officials who still haven’t reconciled themselves to losing one of their nascent empire’s richest provinces. Once Brexit happens and life goes on, expect things to get even weirder. Some of my readers may be old enough, as I am, to remember the very public nervous breakdowns suffered by arch-conservative newspaper columnists such as George Will when the collapse of the Soviet Union robbed them of the enemy around which they’d built their entire public lives. I expect to see more of the same thing this time, with columnists in the Guardian and the Independent solemnly announcing that as a result of Brexit, Britain will shortly sink into the Atlantic or be invaded by an all-conquering army of rabid Australian sheep. Uranus, finally, is over there by himself in the sixth house, at the very beginning of Taurus. The sixth house in mundane astrology governs public health, and also work conditions and the status of employees. Uranus in Taurus in that house warns of a potential epidemic affecting the neck and throat, which are ruled by Taurus; since he’s inconjunct the Moon and semisquare Neptune, this position also warns of labor unrest and the threat of strikes. All in all, it’s going to be a lively time, and the British political scene will be shaken good and hard by it. All things considered, though, a great many Britons will be better off once the dust settles and Britain resumes its normal state of wary isolation from Europe’s vagaries and closer ties to its former colonies than to its immediate neighbors. How long it will take the privileged classes and the media to come to terms with that reality is another matter -- but the privileged classes and the meida are less important than they imagine, and Brexit is among other things a cogent demonstration of that fact.